Eclipse is very project oriented. But with the release of MCU10.2 it is possible: I can program my boards without a project . All what I need is the binary file I want to flash. Really? Well, close. Some setup is still required. In the following steps I’m using a new and blank workspace. The same thing can be used with projects in the workspace too. Then things are even easier as I can re-use settings. But here I’m going to do the heavy metal stuff naked, without a project, but with a Magic Wand. Actually, it is a Magic Blue Flash Bolt :-). Oh, and here is it: it ask to create a ‘System’….. OMG! System, Connection, Target or what the ….? The ‘Target‘ specifies the CPU used (e.g. MCF51JM128), with its initialization script (if any) and the memory configuration needed (if any). The ‘Connection‘ references a the target, plus it holds the settings how I connect to the target, with the Interface and settings for it, e.g. P&E USB Universal Multilink. 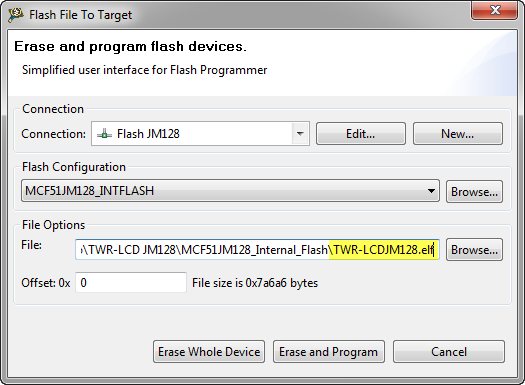 The Flash File to Target needs a Connection. So we need to create a Connection and a Target. Ok this is the Connection. 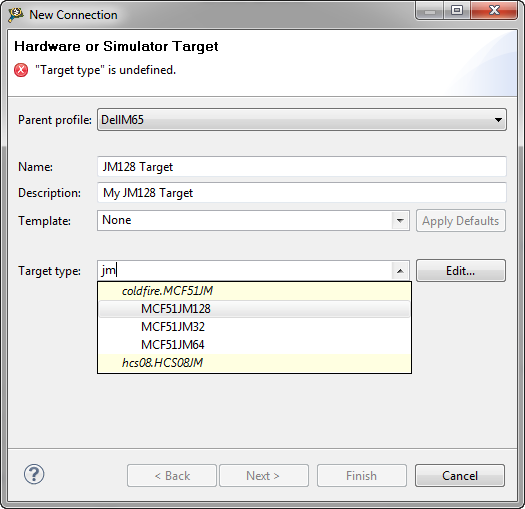 Here I can configure the connection settings, and create a new Target. I do not need any Initialization or Memory configuration, so I keep these with the defaults. Now I have my connection and target created from the ground up. The file is an ELF/Dwarf file or an S19 one. Pressing the ‘Erase and Program’ button does what it says: it does a mass erase of my device and programs it with the file. 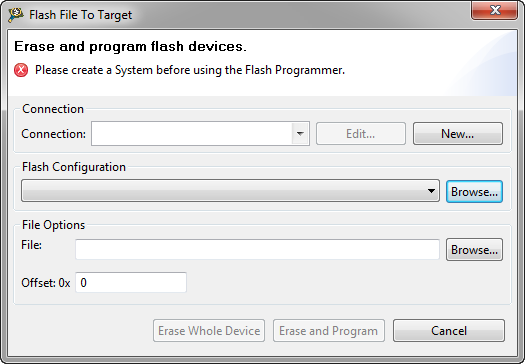 If I need to erase/protect only part of my device, then Programming part of Flash provides the needed information. Time to wave the wand (or flash bolt): Progress is reported in a dialog window, and as well in the console view. CodeWarrior is using a pseudo ‘Connect’ configuration to store the information. Note: While this looks like a normal ‘CodeWarrior Connect’ launch configuration, it will not work as such (if I want to use it directly), as it has no project folder associated. So while this is not really a normal launch configuration, it is still useful to know about it. This entry was posted in CodeWarrior, Debugging, Embedded, Tips & Tricks and tagged CodeWarrior, Debugging, Eclipse, Flashing, Tips&Tricks by Erich Styger. Bookmark the permalink. Just to experiment, I created a project and wrote a program to blink an LED on TWR-KL25z board. The code works fine and I see the LED blinking. Then I removed the project from my workspace and followed the steps in the post. 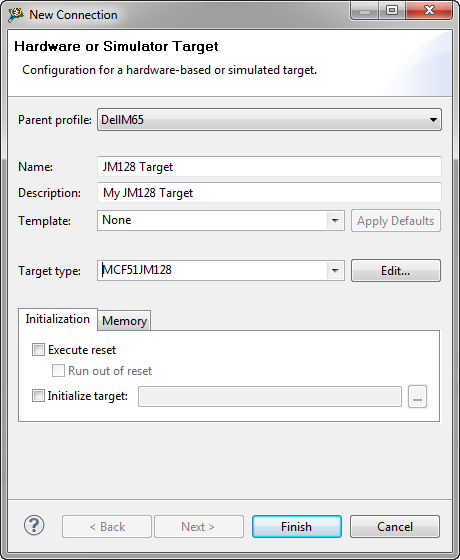 Target is KL25z128m4 with no memory or target initialization. 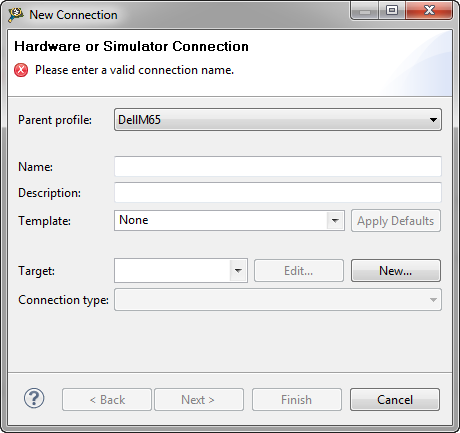 Connection is openSDA. 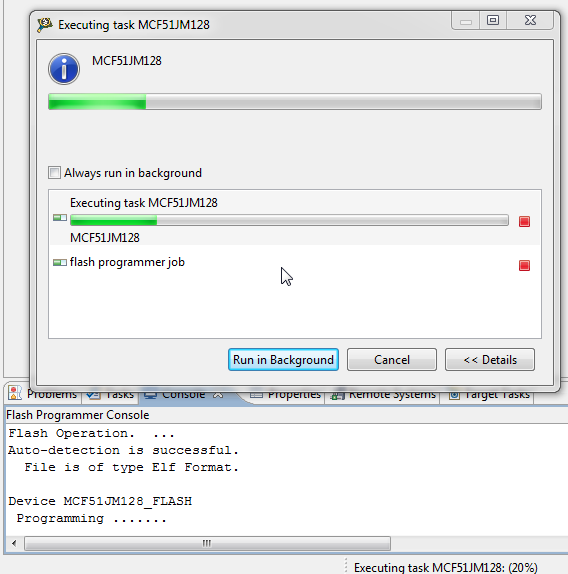 For the file to flash I chose the .elf file from the project and clicked on erase and program but I’m getting an error”Executing task KL25Z128M4 has encountered a problem” and “an internal error occured during executing task KL25Z128M4″… So can you please help in programming/button flashing? Uff! I’m sorry. The problem this code warrior creates!! I can confirm that if you just download, it will not reset the processor so it runs. So yes, this is an extra step. I have a question Regarding Flash Button Programming. 1) First i programmed controller using Debugger method , without controlling Trim register in my code and i got the Total time of PWM of 11 msec (For the PWM code which i have written using Timer) , after POR (Power on Reset) i got Total PWM time of 12 msec.I posted the question on Freescale community and got the suggestion that may be Debugger is writing the Trim Register. After adding the above Trim register control code i got the same PWM Total timiming of 11msec before and after the Power on Reset. 3) Actually i wanted to program the controller without Trim register control code so i used your method , but with your code also i am getting the Total PWM timing of 12msec with and without Trim Register Control code. can you please suggest me do i need that Trim register control code or not in both the programming cases and Which method is correct for programming on Timing delay point of view? I have not checked your device, but from what I can tell is that the TRIM values are loaded from a special location in FLASH and then stored in a RAM register. If so, then you need to make sure that these values are copied from FLASH to RAM at runtime (in your application). It looks like you are doing that (with the copy from 0xFF6F). This means that you need in your application the flash programmed at that location with the value you need. one more Question:- Why trimming value with flash button programming is 31250 hz instant of 39062 hz which is factory trim value, even though i am not changing the trim value in “RUN CONFIGURATION” ? can i see somewhere µC Bus frequency while programing using flash button , like in Debugger programming it shows me in console. I’m not sure, but I would say that this value comes from the run configuration which you have selected for the flash button programming. 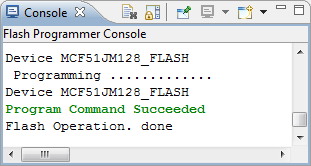 I have question related to flash code in XBEE SMT module have MC9S08QE32 microcontroller. 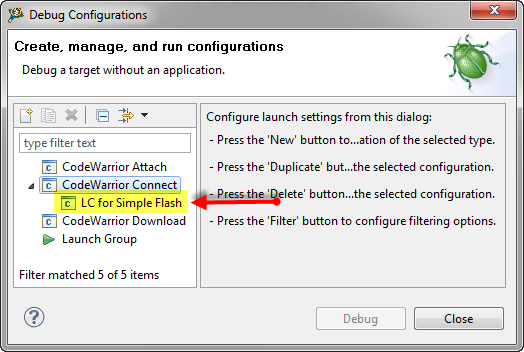 Sir, ‘Flash File To Target‘ menu can not be show in Code warrior 10.2 with XBEE SDK. I have use directly use sample code of give in CodeWarrior 10.2 with XBEE SDK . I am select “Xbee sample application project ” in that next select my device Xbee 865/868 lp S8 module next i have have to select GPIOs project in that i have select blink_led project. Then i have to build that project. 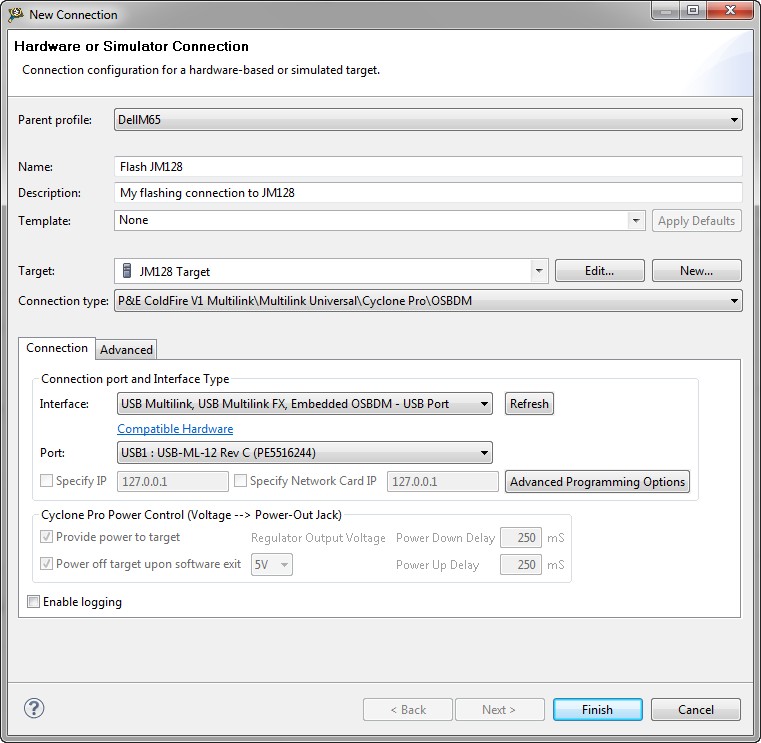 After that i have go to run configure then in connection type i have select “P & E HSS08 Multilink \ Multilink Universal \ Cyclone Pro \ OSBDM ” then i run that project but i got “POWER CYCLE DIALOG” after click ok then i get this window “p&e connection ” . please give me solution of my problem. CodeWarrior 10.2 is very, very old. The current version is 10.6. It could be that this menu item has been added later, so I highly recommend that you move to version 10.6. I also think so but when i am doing changes in trim frequency for run configuration for selected flash it’s not taking the changed trimmed value, don’t know why? The programmer will need some local memory for this. What you are asking for is e.g. supported with the P&E Cyclone (www.pemicro.com). Products from Segger (www.segger.com) can do this as well. 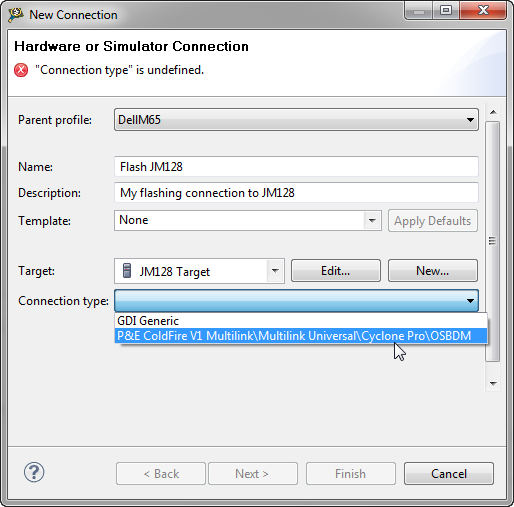 Otherwise you need to modify the USBDM firmware, add an SD card or similar to it. USBDM needs a PC connected to the programmer afaik. Thanks a lot for quick reply but Cyclone costs 900$. We dont have that much finance. Besides, you must have heard about USBDM, it is said that USBDM supports stand-alone programming. But i havent seen any project showing it. I need help regarding it. It depends what you understand under ‘standalone programming’: typically this means that you do not need an IDE/Debugger to program the device, but can use a small program on the host PC. USBDM does that, as well gdb (see https://mcuoneclipse.com/2015/03/25/command-line-programming-and-debugging-with-gdb/) with P&E, Segger and OpenOCD. I’m not aware of such a way with USBDM. In any case, you will need some dedicated hardware to store the image you want to flash (e.g. on a SD card, internal memory of the device or a flash card). This is exactly what the Cyclone has, and what it is used for: for production type programming. Another thing you need to consider: for production programming you should not use ‘debugger’ programming like what is used in debuggers like USBDM/etc: if you want to be sure that the FLASH is programmed according to the specs so it lasts for the time in the specs, make sure you are using a certified programmer for it. That’s where the price point of professional solutions like P&E Cyclonce comes into the play. It all depends on your business model: if you are making money with your products, you probably have to think about having the right investment into your equipment? Just my 1 cent. I tried recycling the power to board, sill doesnt work. If I run it has debugger same code works time. does it work if you download it with the debugger?